The Certified Surgical Services Manager (CSSM) certification program is for perioperative leaders interested in improving and validating their managerial knowledge and skills so as to advance the performance of their surgical services department. CSSM certification validates the achievement of the baccalaureate prepared manager who demonstrates current proficiency as an administrator in the perioperative (pre-, intra-, and post-operative) setting. CCI delivers the CSSM exam to recognize the important role managers have in directing staff, programs and budgets in delivering safe patient care. The purpose of the CSSM exam is to provide recognition for the important and distinct role of surgical services managers. How do I earn the CSSM® credential? 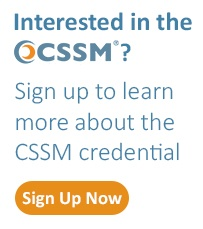 Why should I seek the CSSM® credential? Validate perioperative managerial competency at a two-year work experience level. Establish a standard of excellence for managers working in the surgical services department. Position the manager for future developments in perioperative administration and leadership. Who is the target population for the CSSM® exam? The CSSM credentialing program is for professionals who work in the surgical services department in a managerial role. It is designed for those who oversee personnel, and/or a budget, business unit or service line. Professionals with the following titles are all eligible to take the exam: director, assistant director, manager, assistant manager, supervisor, coordinator, team leader, service line leader, charge nurse among others. Applicants must meet the eligibility requirements. Identify professional development and continuing education needs as well as anticipate changes in the work role of surgical services managers. This job analysis details the tasks performed by surgical services managers and the knowledge and skills required to complete those tasks. From the job analysis work, CCI’s test development partner identified seven core subject areas in which all certified managers must be proficient along with the percentage of questions in each subject area. Candidates will take the CSSM exam at a Prometric testing center. Prometric is a leading professional testing service agency with over 300 locations nationwide. Once your CSSM application is processed and approved, CCI will email you instructions on how to schedule your testing appointment. You will select a time, date and Prometric testing location that are convenient for you. The CSSM exam is a knowledge-based exam which assesses the knowledge (what a surgical services manager should know) and tasks (what a surgical services manager nurse should know how to do) with two years of managerial experience. Upon successful completion of the exam, a candidate will be awarded the CSSM credential for a three year period. Your CSSM credential will expire on December 31st of the fourth year.